Ron was my big brother, my role model, and my friend. He was five years older than me—old enough to be the teacher in our imaginary school and the inventor of the neighborhood paper, but close enough in age to get down on the floor and play with me. 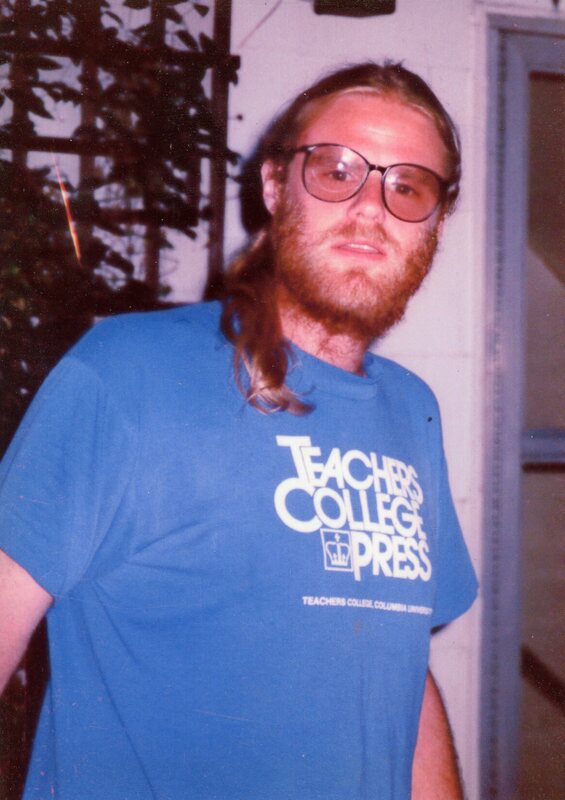 Ron during the summer of 1991, the last time I saw him. We sometimes called him a gentle giant. It wasn’t because of his weight—even though at one point he was well over 250 pounds—but because he was 6’ 4” with broad shoulders like a linebacker. And yet, he was the gentlest soul. After an explosive childhood, he stopped getting angry sometime around age twelve. He had an encyclopedic knowledge of history, music, and movies. He loved watching football on TV but never played any sports himself. He started jogging before he left home. I can’t remember if he was in high school or already in college. I think he was in college. It was part of his plan for losing weight. At first, he was too shy to run outside so instead, he would jog in place inside the house. Eventually, he became an outdoor runner, and after moving to New York City, he started running in races. He decided that before his 30th birthday, he would run in the New York City Marathon. He didn’t quite make that deadline, but he did run it in 1989 when he was 31. He got in again the next year, but couldn’t participate because of a running injury. A month later, he died in a stupid, freak accident. 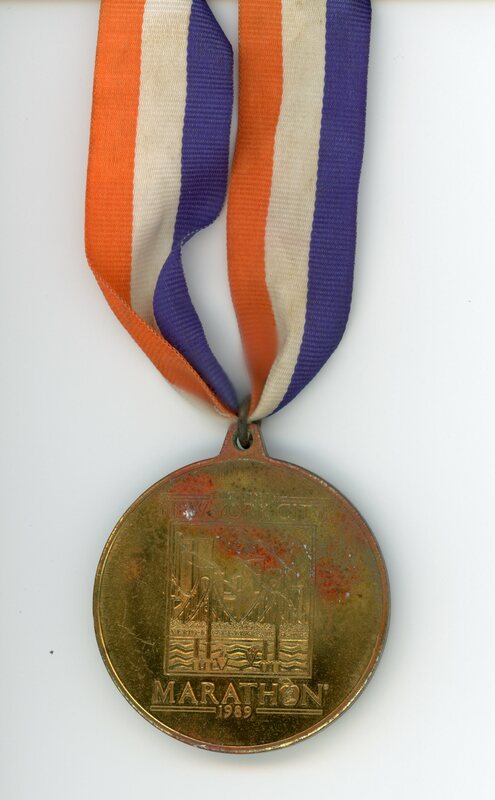 Ron’s medal for completing the 1989 New York City Marathon. Losing Ronnie was and continues to be the most painful experience of my life. It’s when I confronted mortality personally, viscerally, emotionally for the first time. I lost a part of myself. I don’t think you ever get over that kind of grief. You just get used to it. You get used to the fact that the unimaginable has occurred and it can’t be undone. Ron has remained an important person to me even after his death, and nowhere more so than when I run. I’ve often felt that he’s running there alongside me, a gentle supportive companion. I started doing races myself sometime in my 30s, but had no interest in ever doing a marathon. Until one day about five years ago I had a vision of running with Ron through the streets of New York City. And suddenly it made sense to try and sign up for my first marathon. But getting into the NYC Marathon isn’t easy. Either you have to be faster than I’ll ever be, or raise thousands of dollars for charity, or win an entry in the lottery. After four years of trying through the lottery, I got in in 2014 but had to postpone because of my trip to Poland. So here I am, finally about to run in the New York City Marathon. I didn’t expect them, but walking from Penn Station to the Javitz Center to pick up my bib number today, there they were. Those raw emotions—love and grief intertwined with the excitement of the upcoming race. And there I was, bawling on 34th Street. It’s fitting that the marathon is on November 1st this year, All Saints Day. It’s one of my favorite holidays in Poland, the day to remember the spirits of those who have left us. The day to visit the cemetery, clean the graves and decorate them with flowers and candle lanterns. I’m sure the cemeteries are already glowing with candlelight at night. I won’t clean graves or light candles this year. But I will run with my big brother as my companion, together with 50,000 other people, through the streets of New York City. I recently came across two letters Babcia wrote to Mama, one on August 31, 1945 and the other on February 4, 1958. The letters have some surprising parallels—Babcia’s instructions about proper modes of behavior and attire, and her lack of enthusiasm about my mother’s marriage plans. I’ve been trying to sort out what two letters indicate about the relationship between my mother and grandmother. “Papa says that if you decided to marry, which wouldn’t necessarily thrill us, not because of Bimbus (a nickname I don’t recognize, but it probably refers to Mama’s first love Władek) who is a very decent fellow, and that means a lot, but because of your present state of health, so definitely let us know your plans and don’t worry that it will cost us. We want to pay for it. Besides, we never expected you to inform us, so we don’t want to be silly, but we think, without imposing on your views, that you are making too much trouble for each other, marrying, and that’s only worth doing when people love each other horribly. /you know, even then it’s often not worth it. I can only wonder at the remarkable, long sentences. Though she says she doesn’t want to impose on Mama’s views, clearly she expresses her disapproval of Mama’s desire to marry. But why? Was it really concern for Mama’s health? Earlier in the letter, she refers to Mama’s operation. But even the issue of “health” is ambiguous—could it refer to a physical health issue or a mental health issue? Surgery to repair her war injuries or something else? Or might it rather be a reflection of Babcia’s own ambivalence about marriage generally, shaped by her own trials with Papa and perhaps also Mama’s choice of a partner? I’m not sure how to read the tone of the letter, either. Is Babcia angry? I think maybe. She seems to be cloaking her efforts to exert an influence on Mama in expressions of affection. In the letter, Babcia also instructs Mama about what kind of coat she should get. It should be straight and roomy in front and back. She even adds a lengthy handwritten note with further details about its style and price. So much is left unsaid in this letter. It provides me with more context for understanding my grandmother and father’s dislike of each other, though it doesn’t clarify the root cause. Why does Babcia end the letter abruptly, “I have to run. Warm kisses?” Is this another expression of anger, or perhaps symptomatic of a distance that has grown between my mother and grandmother over a long period of time? The letters also reflect Babcia’s concern with etiquette–the wedding announcements, the proper cut of a coat. She appreciates a bargain, but also values giving and receiving generous gifts. Paying for things for someone seems like a way of expressing affection. These are more clues to my mother’s and grandmother’s lives. But they remain fragmentary. Only speculation holds them together. My friend Justyna, a regular reader of the blog, remarked recently, “I don’t hear/see that much about men in your mom’s family.” And she’s right. Most of the relatives I knew growing up were female—Mama, Babcia, Auntie Nunia, Aunt Teresa. Most of the family stories featured them and a few other female relatives—Auntie Lusia, Mama’s cousins big Pauline and little Pauline. A simple explanation might be longevity; the men died young and the women lived much longer. Babcia lived to 99, Auntie Nunia to 97. But there’s more to it than that. I come from a long line of strong women. Each one made an impression on those around her, though each did so in her own way. I get the sense that another thing that was passed down was close, but contentious relationships between mothers and daughters. Perhaps it’s inevitable when strong personalities collide. I don’t know a lot about my grandmother’s relationship with her mother. All my mom has told me about her grandmother is that she was physically small but she took charge in her large family. She had a dozen children over 24 years, starting with a daughter when she was just 19 and ending with twins at age 43. After the twins (one of whom died as an infant, the other as a teenager), my grandmother was the youngest. Looking at them together in the photo that launched my search for my Jewish heritage, I imagine they probably loved each other but drove each other crazy. More likely than not, my great grandmother was a very religious Jew. My grandmother was fun loving and bold, and eventually rejected her religion and her family for a life in Warsaw society. I dissect the specific features captured in the photo, scouring them for hints about the people photographed. Babcia’s dress is silken, with what looks like a fabric train in back, a light colored inset at the bodice, and a rose-like adornment at her waistline. Even more striking is the dress’s length, reaching only to mid-calf and revealing a stockinged leg and high heels. Her mother, by contrast, wears a long dark dress made of matte fabric except for a silky dark addition at the wrists and shoulders. My grandmother looks coquettishly into the camera; though she does not smile, you can almost see her dimples. Her mother’s expression is serous. The thing that hints most directly at their relationship is the way my grandmother grips her mother’s hand. But what does this gesture say? Is it a sign of affection? Might it be an indication of special intimacy? Or perhaps is my grandmother expressing her possessiveness? Or her power over her mother? My great grandmother rests her hands on her knees straight in front her. My grandmother’s knees are turned toward her mother, her body at an angle to the camera. I talked about this photo at a conference recently, and remarked how my grandmother is more brightly lit than anyone else in the photo. She’s positioned in the foreground as if she is preparing to leap out of the frame. When I described the way my grandmother clasps her mother’s wrist, and asked what it might communicate about their relationship, someone suggested it might not be a gesture of affection or power so much as reassurance. As if my grandmother knew she would leave her mother soon, and wanted to reassure her everything would be alright. My Mama and Babcia were in many ways opposites, also. Mama was shy to the point of fearful of social situations; Babcia thrived as the center of attention. And yet, both could command any room they entered. Partly, this is a product of upbringing. They knew how to dress elegantly and carried themselves with an air of refinement that stood out in casual American settings. While Babcia entertained and commanded, Mama was more likely to draw people out and empathize with them. Their relationship was complicated. On one hand, they depended on each other throughout their lives. 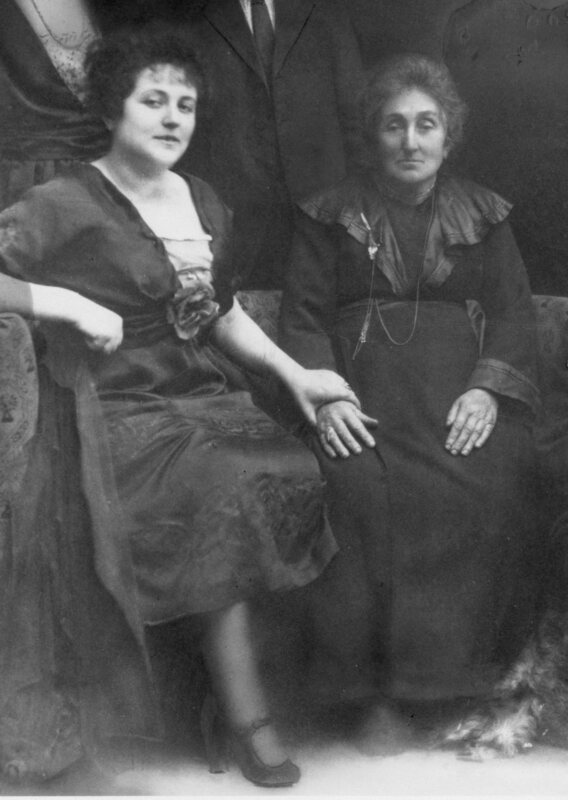 Babcia helped Mama when she was injured and had to find a way out of Poland. Mama helped Babcia when she grew older, managing her finances and taking the train into the city from Long Island to visit every week. On the other hand, I get the impression Mama resented being “abandoned” by her mother at two critical junctures in her life. The first time was when she was left with an aunt as a very young child when Babcia ran away from her first husband and remarried. The second time was when Mama became a mother (eventually of four children) but Babcia decided to move to Puerto Rico. Further, Mama was deeply hurt and resentful when toward the end of her life, Babcia treated her poorly and failed to appreciate everything Mama did for her. Intellectually, she knew Babcia’s ill temper was a product of age and illness, but that didn’t ease the sting of feeling her efforts unrecognized. I think my mother was inordinately sensitive to her mother’s criticism, and perhaps annoyed with herself that it mattered so much. But maybe (probably) I’m projecting because that’s how I feel about my relationship with my mother. 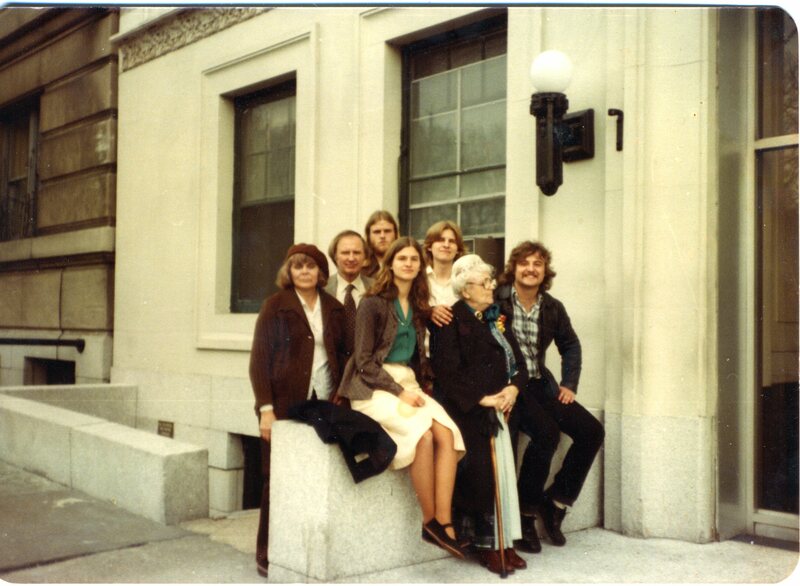 The Galbraiths with Babcia outside Babcia’s apartment on Riverside Drive sometime in the early 1980s. There are very few pictures of my mother together with my grandmother. Mama was reluctant to have her photo taken any time with anyone. This one, taken outside of Babcia’s apartment sometime around the early 1980s, is interesting for two reasons. First, it shows the distinctive style of both women. Second, there’s a hand on Babcia’s shoulder, probably my brother Chris’s [oops. Krysia’s right. It’s Wiley’s hand 10-29-15]. This gesture appears in many family photographs. It’s hard for me to say if I am very similar to my mother or very different. It’s probably both, though neither made it easy for us to get along. I have no doubt that I became a professor, in part, to realize her dream for me—a dream she gave up for herself in order to have a “normal life” as a wife and mother. Perhaps it’s typical of my generation that I was raised believing I can have it all (and I more or less do, but there’s a price to pay for that, too). It’s hard to find the words to describe our relationship. What comes out is either a string of platitudes or far too much detail. Suffice it to say we were very close. So close, I was angry with her most of the time between the ages of 13 and 33, probably as a way of separating and asserting my autonomy. Mama was simultaneously weak and strong, shy and bold, afraid of meeting people and quick to establish intimacy with them. It drove me crazy that all my friends loved her and confided in her when I felt like I couldn’t talk to her myself. I’m just grateful that I finally stopped being mad. And now that I can’t talk with her anymore, I miss her. She was the person I was most likely to turn to in a crisis, like the time I was in labor, Ian was breech, and I and couldn’t think clearly enough to decide whether to continue with a natural childbirth or have a Cesarean section. She knew what to say to reassure me, to help me make the right decision. 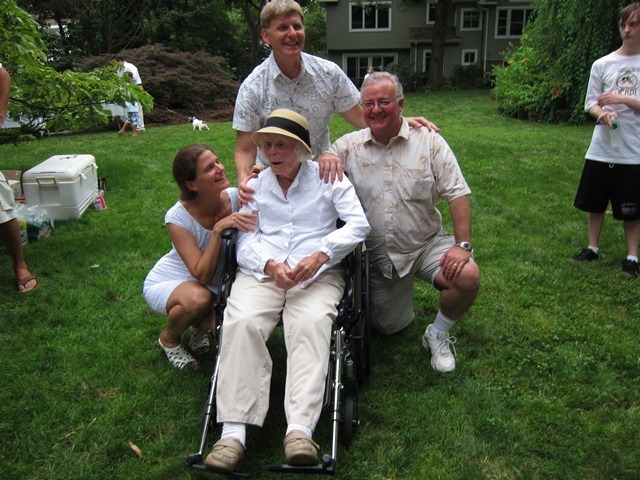 Mama’s 90th birthday, celebrated in white. This photo is from Mama’s 90th birthday party in June 2012. Mama had often talked about wanting to have a white party in her garden. So my brothers and I made it happen. Dozens of relatives, friends, and even former neighbors came to celebrate, and everyone really did dress in white. In this photo, I notice again our hands. My brothers and I form a protective ring around Mama, our hands on her arm or shoulder, and Chris with his other hand on Wiley’s shoulder. We do so casually, an unorchestrated mark of intimacy and affection. And an appropriate complement to the photo of my grandmother with her hand placed upon her mother’s wrist. Going through boxes of hastily collected papers from Mom’s house I find so many unwritten cards. Sympathy cards: “Thinking of You. I know you’ll make it through this.” A Thomas the Tank Engine birthday card: “Peep-peep grandson!” I like to think that one was meant for Ian… There are also postcards: Salvadore Dali’s “Portrait of Gala;” two views of the Biltmore House; a café scene in New Orleans; the Isabella Stewart Gardner Museum in Boston. I find random addresses of people I don’t know, torn off envelopes, Three envelopes with “Maria” written on them in my dad’s hand—but they’re empty; his cards are missing. How do I dispose of this stuff? But why would I keep it? I hold on to the memories they evoke. The bits of my mom’s story they signal. Mama liked to send cards. She always took the trouble to include a personal note. We arrived by car yesterday at 5 PM. It was an exhausting trip but we are happy to visit with our son Chris. We stopped in Virginia and drove through the Skyline Drive with the Blue Ridge Mountains all around us. A heavy rain stopped and there was no one on the road. It stops there. Why didn’t she finish the letter? Why didn’t she send it? Maybe she lost track of it? Or couldn’t find the address? Like most great American institutions, the American Society of Plastic Surgeons (ASPS) — known until 1999 as the American Society of Plastic and Reconstructive Surgeons (ASPRS) — developed mainly through the sweat and toil of immigrants. In this case, it was two surgeons from Europe who came to the United States after World War I, Jacques Maliniac and Gustave Aufricht. The two doctors were as unalike as any two men could be, except for their dedication to their craft. Despite his French-sounding name, Dr. Maliniac was born in 1889 in Warsaw, Poland. After studying with the leading plastic surgeons on the continent before the war, he was called into the Russian Army at the outbreak of hostilities. A small, intense man, Dr. Maliniac, who was Jewish, came to the United States in 1923 and decided to stay as anti-Semitism was on the rise in Europe in the 1920s. Settling in New York City in 1925, he opened a thriving private practice, and convinced the administrators of the City Hospital system to establish the first division of plastic surgery at a public hospital. 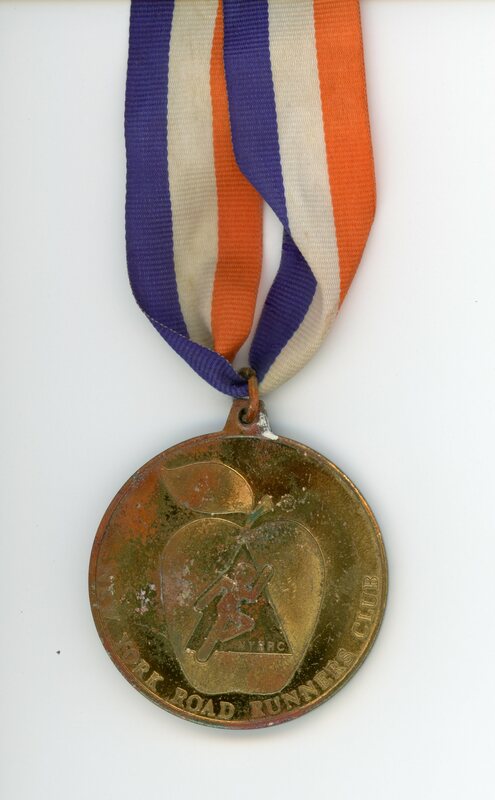 Dr. Aufricht, born in 1894, was a native of Budapest, Hungary. Like Dr. Maliniac, he treated wounded soldiers during the war, studied with the leading practitioners in Europe and arrived in New York in 1923. And like Dr. Maliniac, he was Jewish and decided to stay here when things became inhospitable in the Old World. However, the similarities ended there. Where Dr. Maliniac was considered bombastic and dictatorial with his students and residents, Dr. Aufricht, who went by the nickname “Gusti,” was genial and outgoing, but no less a commanding figure, loved and revered by his charges. Interesting that Mama sent her Jewish doctor a Christmas card. Did she know his religion? The card was postmarked December 1980. If she was his patient around 1950, she probably sent cards to him for 30 years. 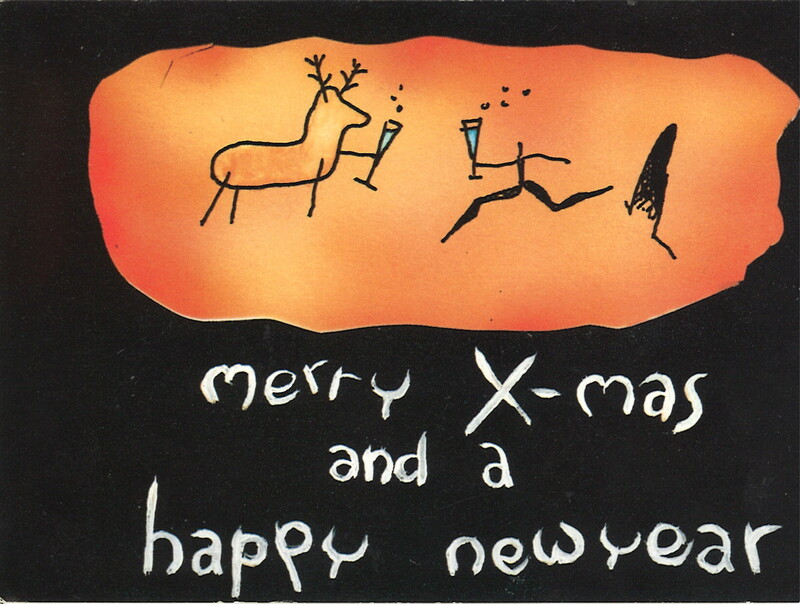 A postcard I sent from Poland, probably in 1991. And then this photo of Mama and Babcia on the couch in the living room at home. The tree and ornament in the left foreground signal it was around Christmas, also. Mama is in silhouette, eyes downcast. She appears to be spooning something out of a mug to give to Babcia, who is leaning toward her with closed eyes. Or maybe the camera just caught her blinking? She is bundled up in a down jacket and a blanket, like a child. When was this? Near the very end of Babcia’s life. Could it also be 1991? Maybe Mom and Dad returned from Texas before the holiday? 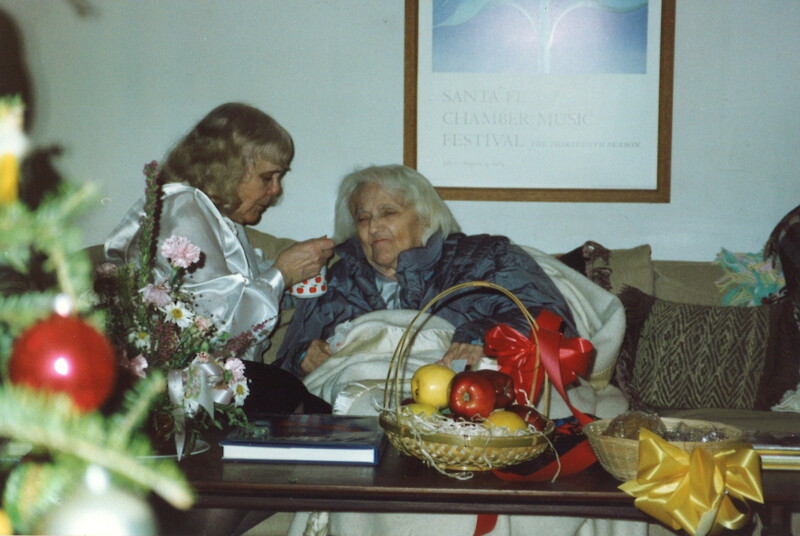 It’s so rare that I have seen photos of my Mama and Babcia together. There seems to be so much tenderness in my mother’s attention, as if in this moment of caring all the tension between them dissolved. So I just read your blog post quickly. I know you don’t like stereotypes (who does? ), but I can’t resist telling you that I thought you were Jewish the first time I met you. And it did have something to do with your hair, but also with your way of being. I love Jewish-looking hair myself and wish I had it! Sorry if I’m being lazy in this short cut. My response: Thanks. I wonder, too if there can be some sort of recognition of ethnicity/culture–a reading of multiple clues such as hair, gestures, etc. Whatever it is, I don’t believe it can be a simple reading of physiology. Regardless, I wear my hair proudly! Another reader: I had to respond to what you said. Growing up Jewish, I knew/was told that Jewish hair was different. I could never (nor could any of my family or friends) wear the straight bob. 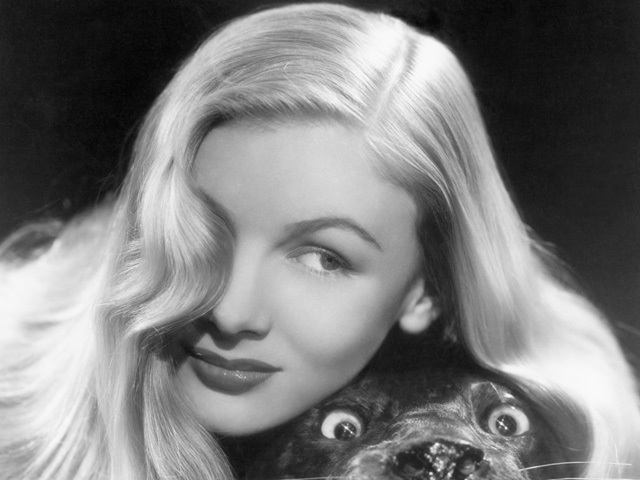 I always wanted Veronica Lake’s hair. Straight, just hung there, no body. (You may not know who Veronica Lake was, but if you go on the internet you would probably get a picture of her.) I had thick hair – not curly. It is only recently with all the straighten products that one can have that straight look. I, and all my friends, had our hair thinned. We certainly wanted to look like the movie stars. Straight hair, small noses. I never thought it was a way to stereotype someone. It just was the way it was. Didn’t all young girls want to look like the movie stars? I was grateful when Barbra Streisand became famous. Although she never had the “Hollywood” image she was glamorous, which kind of made the big nose, thick hair seem more acceptable. The question I occasionally ask myself – Why growing up didn’t we question any of this and just accepted it? 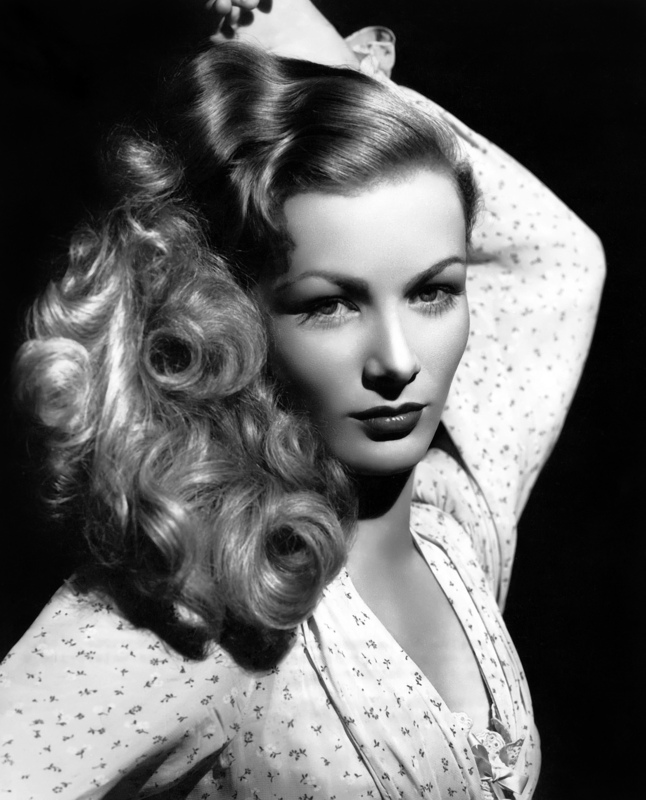 More than likely, any wave in Veronica Lake’s hair was added with curlers. And an exchange with a third reader who is not Jewish, but has full, curly hair: A wonderful essay that resonates with many things I’ve heard about my hair my whole life. You know, in Poland I had always been told I had beautiful hair. Then I came to the US at 18 and was surprised to hear that my hair was “frizzy” and apparently in need of stuff(s) that would get rid of that undesirable quality. I was thinking to myself then: “What? My hair is unusual [in Poland] and great, it’s crazy to say that anything about it should be “fixed.” But in the US, it sounded like in that particular situation (I’m talking about one person) my hair was seen as almost African-American or something. Then I realized “frizzy” was a concept here; it had never been in Poland, at least not in the Poland of my youth and childhood (where there were almost no “products” whatsoever to begin with). My response: That’s really interesting. I think you know I’ve always loved your untamed hair. You are from the generation that was tired of the relative homogeneity of Polish culture, and would find your amazing ringlets exotic and beautiful. And it’s really interesting to learn that “frizzy” is an American concept. It’s definitely something I grew up trying to control. So yes. Hair seems to be wrapped up in our sense of identity, of being “like” some people and not like others. But these things aren’t fixed, either. Sometimes we feel compelled to do things with it so that we better fit Hollywood images, or what others tell us we should be like, or how we imagine ourselves (ideally) to be. And sometimes it’s good to just appreciate what we have.